The Sunshine Blogger Award is a great community award that is given to those whom you personally feel bring great positivity to the community. Stephanie was nominated by Alex Fitzpatrick, who also has an amazing blog herself. After you’ve been nominated, you answer the questions given to you by the previous nominee, and then you create more questions for those whom you’ve decided to nominate! It’s a great pay-it-forward method to bring attention to bloggers of all sorts. So …now to the questions Stephanie asked me! What inspired you to start your website? I was hired on as an unpaid intern to a site that will remain unnamed. Eventually, they were kind enough to promote me and start to pay me for my posts to their blog, but it quickly became a hassle. At the time, that site was my only form of income, I only got paid once a month, and I had to fight for my paycheck every single time. Quickly afterward, the site was hacked on several occasions, and the creators of the site decided it wasn’t worth keeping on. Everyone got let go. After some other unfortunate details that involved some complete rude behavior from my former editor, my Father suggested starting my own site, and here we are today. It was quite the rollercoaster to get here, and maybe someday I’ll go into more detail. How would you describe your website in an elevator pitch? FemSTEM.com is a news site-slash-blog that, though aimed at women and girls, is a fun place to read about science for all. We regularly interview great female scientists from around the world, as well as try to stay on top of STEM news as much as we can. Right now — we is me — and I’m a one-woman operation, but in the future, we hope to grow enough to hire others. What part of your website are you most proud of? The part of my site I’m the proudest of is the part of the site I didn’t even write. I owe so much to Melissa C Marquez, who wrote the phenomenal #STEMSaturdays series (here). It’s absolutely incredible, and worthy of a read right now! Is there anything you would like to include more of on your website? More posts in general, ha! Balancing FemSTEM, my personal life, and my work life has been increasingly difficult these days, but I’m learning. I’m trying desperately to get my groove back and get back to writing posts three times a week. Is there anything new you would like to one day try with your website (e.g a new feature, add a podcast, etc.)? I’m working on so many things! One is a Kids section that’s currently under construction, as well as a podcast! I’ve actually recorded three episodes, but for one reason or another, things haven’t added up for me to actually get to posting them. One day soon! Twitter mostly! 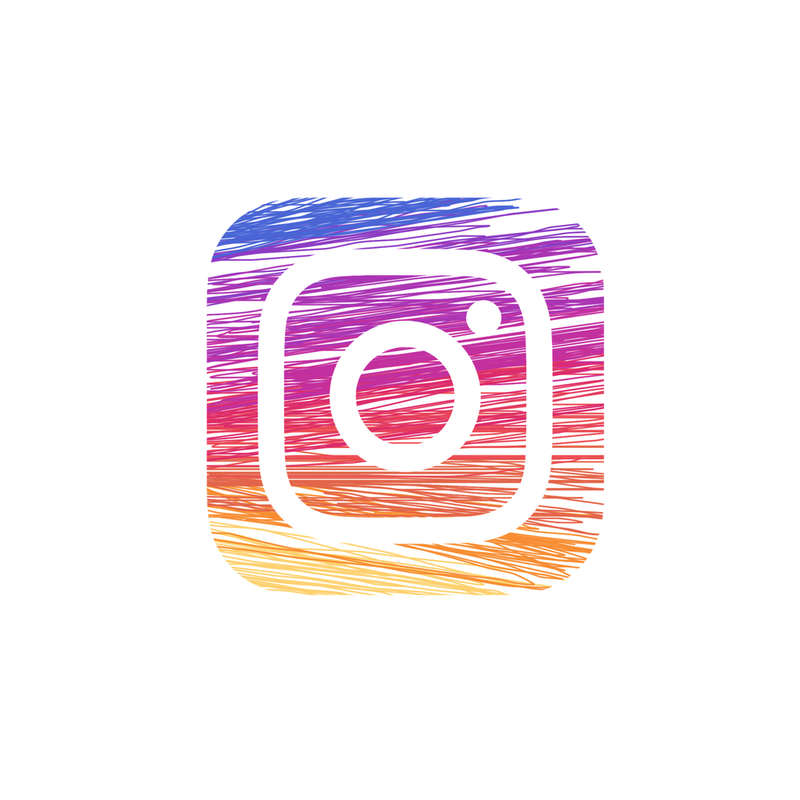 I’m trying to get into the Instagram realm, as well as move on top doing more science communication in real life! In fact, I’m working on a project right now for #scicomm in real life, that you guys will hopefully hear about soon! When working on a new post, what is your writing process like? The hardest part is finding the time and motivation. Finding those two things at once is incredibly challenging. It’s so often that I find some kind of motivation while I’m at my day job, and then finding I’m far too mentally exhausted to even try when I get home that day. When I do get that perfect chemistry, research happens first if it’s a news article of some kind. I find all the sources I can, link them in my reading list, and make an outline before I start writing the actual post. Depending on how complicated the topic is, and how much I know about the topic to begin with, it can take me anywhere from an hour to a day to get the initial draft out. Editing from there isn’t too hard. If it’s an interview, I do all the research I can on the woman I’m interviewing. If they have a website, it’s that much easier. Then it takes me a good two to three hours to polish up the questions before I either send them via email to the interviewee, or I sit down with them via Skype or another IM chat. I really need quiet (or white noise) when I’m writing, otherwise I get horribly distracted. I usually have a drink of some kind at my desk, and maybe a snack, so I don’t have to move for as long as humanly possible. Once I’m in my mode, if I snap out of it at all, it’s very hard for me to come back to it. Are there any forms of outreach that you’re interested in trying/doing more of, besides your website (e.g. presenting at Comic Cons, hosting a Youtube Show, etc.)? What kinds of movies/books/music do you like (comics are included)? Oh, my goodness. I’m one of those people who loves almost everything? Reading has been my passion for a long, long time. I’m a big modern classics reader (i.e. books like the Great Gatsby and Animal Farm), as well as a big essays reader. As far as movies, historical movies or period dramas (based on a real story or not) are my absolute favorite. Music — I’m into Broadway music mostly. Though, I’ll listen to nearly every genre. And I adore comic books. Well, that might be a slight exaggeration. When I find a comic I like, I adore it. I’m a big fan of DC (the Batman universe in particular. Barbara Gordon — aka Batgirl and Oracle — is a HUGE #STEM gal, especially in the 80s-90s era of comics), though they’ve failed me in a large way as of late. When you were a student (at any level), did you enjoy being in school? Yes, and no. Like a lot of people, I struggled with math in a large way. As the years went on, I found myself enjoying schooling less and less. I got overly depressed in high school, and I let that and my math struggle get the best of me. As a result, I finished high school a year late. When I found subjects I loved (Earth science, psychology, and English class for the most part were my favorites in high school), I really loved them and flew through them with flying colors. However, the subjects I struggled with, I let them defeat me, and it made me really dislike school. What is a field of study outside of your own that you’re interested in? Nearly everything. Which sounds like a cop-out, but it’s true. That’s what makes this blog so much fun to write. I love so many aspects of STEM, and I want to learn about everything. If anything, this blog has taught me so much. Technically, the rules say you want to nominate 11 blogs, but so many blogs have already been nominated! I’m going to try my best to nominate as many people as possible. Fins United Initiative’s Bite Blog — Which is also Melissa’s, but it’s entirely different! Her STEM Story — One of our biggest supporters, and previous sponsor! What got your interested in your current field of STEM? What’s your favorite method of outreach? Is it your blog? Why or why not? What is your educational visual program, whether it’s a TV program, or a YouTube program (i.e. SciShow), etc.? Who is your current STEM inspiration? What’s your favorite snack to have at your desk when you’re blogging? Do you have a day job? If so, what is it? Is it STEM related? This might be kind of a vague question, but what would you say the biggest issue plaguing STEM right now is? I’ve noticed retailers are starting to hop aboard what I’m going to call the ‘STEM bandwagon’. This is probably a good thing, as kids who see toys meant to encourage them towards STEM will be drawn to STEM as a whole, but do you see this being a retail fad, or something that will last for years to come? What is the most common STEM misconception that you hear? How do you combat it when you hear of it? What’s your current project and what about it excites you the most? Dear Stephanie, thank you so very much for nominating me for this award. It means the world! This interview is with Tina Blackmore, who works as a Science Engagement Research Partner for MARS. Q: Hello, Tina! First of all, I want to thank you for taking time out of your day to answer some questions for our readers! My first question has to do with how you got to where you are today – the basics. I was told that you wanted to be a veterinarian as a teenager! What sparked your love for animals and inspired you to try to get into veterinary work? A: Although I only had pet hamsters as a small child, I used to have horse riding lessons, and with that also came frequent contact with all the dogs and cats that were residents at the riding school. I have always loved solving problems and think that is why, in part, I enjoy science so much. Veterinary science seemed the obvious way to link the two by providing an ill animal treatment after diagnosing them. However, whilst my original desire was to pursue a career in veterinary science, I decided to re-think my career following a couple of weeks of work experience at different vet practices. So, I continued to follow my love of science through academia, which led me to research. When I was younger, it was never suggested that I could combine animals and science through research, yet it is due to this that I am in my current role. Q: Now you work as a Science Engagement Research Partner. What sparked the change in interests? A: My PhD was about a common disease for ponies, which meant I met a lot of horse owners who were keen to find out more about the research project. This allowed me to explore the ways in which I could explain the ideas, aims and results of my work to non-specialist audiences, whilst maintaining scientific accuracy. As a result, I developed an interest in science communication and a passion for making science accessible to anyone who wants to know more. This then led to my current role as the Science Engagement Research Partner for WALTHAM, part of Mars Petcare. Q: What basic message do you hope that your particular brand of science communication gets across? What strategies do you use to get your point across? A: All of the science communication at Mars Petcare ladders up to demonstrate how we can deliver our vision: A BETTER WORLD FOR PETS™. There are a number of ways in which we do this, but our activities and campaigns are underpinned by scientific studies. WALTHAM, as a Mars Petcare research centre, is the primary publisher of original peer-reviewed papers and therefore a significant contributor to science communications by Mars Petcare. The key findings of these studies are then amplified by the Global Science Communication team across numerous media outlets. Q: Other than science communication, what does your job at MARS as a “Science Engagement Research Partner” for Pet Nutrition entail? A: Mars Petcare now has over 70,000 Associates (employees). Ensuring that everyone understands how the WALTHAM Centre for Pet Nutrition and its science contributes to the ecosystem is essential. We do this by sharing the work we do with visitors to the pet centre on a guided tour, in addition to internal communications. This is supported by the Communications teams at WALTHAM. Q: What would you say is your favorite part of your job? What is the most rewarding portion? A: It’s really rewarding to be able to share the great science we do at the pet centre and how this extends to support all the areas under the Mars Petcare banner. I love being able to aid peoples understanding in an area that excites them. Comments like ‘wow, I never knew that’ epitomise that feeling. Q: Do you have any advice for those getting into science communication? A: Speak to as many people as possible about an area of science that really excites you. Your passion will shine through, and being able to explain a topic that you know so well to those with limited knowledge in the area provides valuable learning experiences. This article was not sponsored. This interview is with Ana Garcia-Marchan, who works is a Senior Technologist for MARS. Q : Hello, Ana! First of all, I want to thank you very much for taking time out of your day to answer some of my questions for my readers! So, for my first question, I want to ask something basic: What exactly is your job in STEM? I was told that you were a Senior Technologist at MARS. What does that entail exactly? A: Being a Quality & Food Safety (Q&FS) Senior Technologist really means being an advocate for quality of our Mars Food products, including Uncle Ben’s and Seeds of Change. I work with factory managers and maintenance teams to help lead multiple Quality Management Processes, including Mars’ Internal Audit and Q&FS Management Review. Through risk assessment, I help drive improvements in Mars’ current manufacturing processes and systems by collaborating with different departments and implementing creative solutions to issues. For example, if an incident occurs and a product is placed on hold, I will not only investigate the incident but develop corrective actions to ensure that this does not occur again. I also participate in external audits and inspections from the Mississippi Department of Health. Q: I was also told that you, as a biochemistry major, believe that STEM plays a huge role in the food industry. Would you elaborate on why you believe that STEM has such a large role in the industry? Sometimes, I believe this aspect of STEM gets overlooked. A: STEM is really about bringing together the principles of science, technology, engineering, and math to; innovate, work on complex and interesting projects, and achieve a common goal. Having been a biochemistry major, I see similarities between the food industry and biochemistry because both are complex and diverse. Metabolic pathways (biochemistry) and the food industry have steps that convert substrates/raw ingredients into a finished product. Each step is critical, complex, and is the key to the next step. In biochemistry, specifically in a metabolic pathway, each reaction produces a product, and that product becomes the substrate for the next step. Similar to biochemistry, the food industry takes raw materials and converts them into a finished product with the goal of getting consumed. I love being able to apply my knowledge of biochemistry to the food industry and being a part of a team that brings products to life. Q: What would you say the main goal of your STEM field is? A: The main goal of my STEM field is to apply the concept of biochemistry not just to the processes that occur within living organisms but relate the same processes within day to day activity. Q: How did you begin to pursue this career? What made you interested in this line of work? A: Growing up, seeing my mother’s ability to use raw ingredients to create a meal sparked my interest in STEM. Many can cook, but I was so impressed by the science behind the art of cooking and how my mother mastered both. Once I got to school, science courses really gave me that hands-on learning experience and reinforced my educational aspirations within STEM. Q: What does a typical day in your job look like? And what’s the most exciting part of your day — or something about your job that you enjoy the most? A: Freedom- let me explain… My job is not the same every day. Although I have responsibilities and deadlines, I love that each day is different. One day I may be pulling a cross-functional team and brainstorming solutions to a particular problem and another day I may be leading quality and food safety training. Q: Do you work in a laboratory? Or does your field of STEM require that your work in other places that may not be seen as common places that science is conducted? A: My field of STEM requires me to work in a manufacturing plant which is not what you would expect. There seems to be a misunderstanding that if you have a STEM degree, specifically a science related degree, that you must work in a laboratory. Q: If you had some advice for girls or other women looking to pursue your career, what would you say to them? A: I encourage young women to reach out to resources (teachers, those who work in STEM fields, community groups, friends, family, etc.) to learn more about the endless possibilities within STEM. Don’t be afraid to apply to competitive schools or seek out learning opportunities within STEM wherever you may be. Join a STEM related club or activity and get involved in whatever way you can. The creativity and innovation that stems from STEM-related fields is essential to creating impactful, positive and far-reaching change. Science Communication is something that is a hot topic these days. The communication to the public about science is extremely important, because everyone is effected by science in their daily lives. Proper science communication can change how the public looks at the world, how the world governments decide to act on certain issues, and can help in bettering the wellbeing of humans, animals, and plant life. However, science communication is not the easiest thing in the world. Not by a long shot. There’s miscommunication, the boasting of bad studies, and some scientists don’t know how to go about science communication to the public at all. While all scientists are definetely not required to communicate their science to the public, a lot of them want to learn. That’s where SCIENCE ART FUSION comes in. 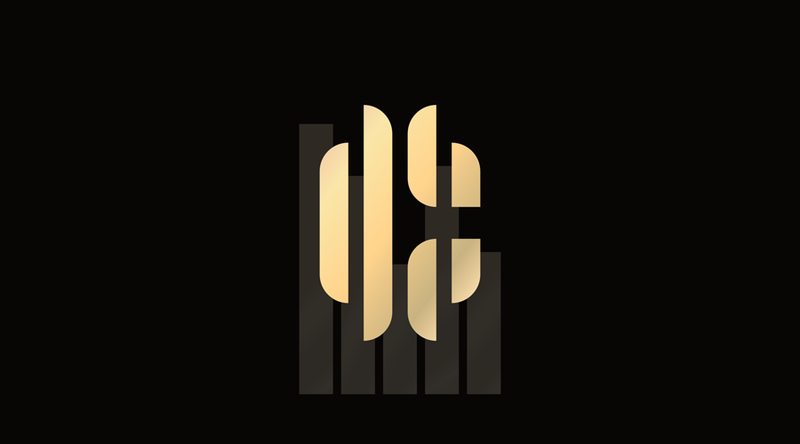 Science Art Fusion is a ‘science communication consultation company that aims to bridge the gap between science and the creative and performing arts’, says Founder RK Pendergrass. Earlier in March, she began a GoFundMe campaign hoping to raise money so that Pendergrass can create online courses “that goes into the nitty-gritty of narrative structure and what makes some stories so universally appealing, and helps science communicators figure out the best ways to apply these narrative skills to their outreach efforts”. Pendergrass herself is a professional performer and creative writer with over ten years of experience in these fields. She says that she wanted to help share her knowledge with the science community “after seeing the importance of narrative being brought up time and again at science conferences and in discussions about science communication”. Pendergrass truly believes that there’s value in this knowledge for the science community, and believes that this type of art can be very helpful in getting this very important communication across. In the two weeks that SCIENCE ART FUSION’S campaign has been online, Pendergrass has thus earned over $1,500 towards her 20K goal. As she notes, starting a company is incredibly expensive. Between the LLC cost, the cost of equipment, the cost of a website, and more. Her hope is to raise $3,500 a month in order to support the website and herself up until August. She wants to help hire and support other science communicators as well in the future to help continue to “bridge the gap” between the communications and their respective audiences. Interested in helping out? You can check out the GoFundMe here, or email RK Pendergrass at prelaunch@scienceartfuision.com for more information! 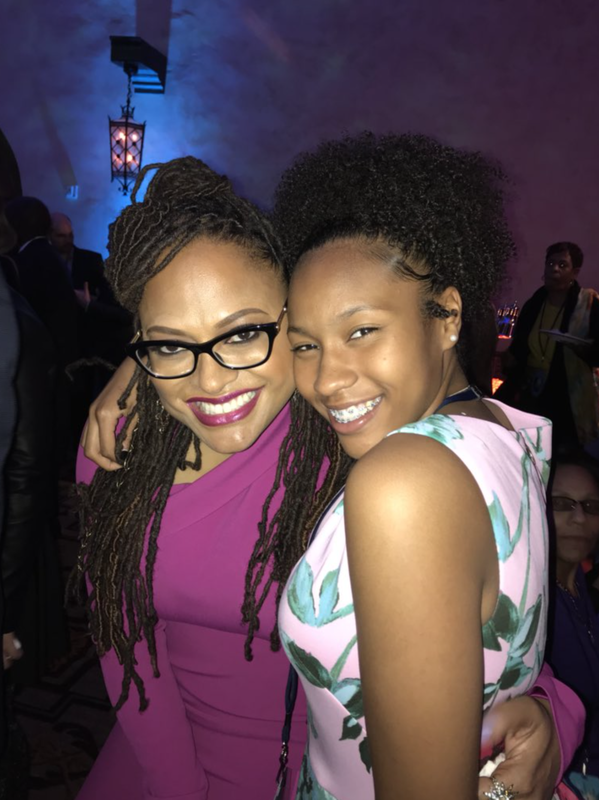 In case you missed it, when Hidden Figures released in 2016, Taylor Richardson was the girl who raised over $20,000 so that 1000 girls could see the movie for free. Her hope was to encourage girls to get into STEM by being able to watch the likes of Katherine Johnson, Dorothy Vaughan, and Mary Jackson on the big screen. When A Wrinkle in Time was announced, a movie based on the hit middle-grade sci-fi from 1962, Taylor Richardson did the same thing. Only this time, she raised $50,000 for girls to see the movie for free when it releases on March 9th, 2018. Why was Taylor so enthused about girls seeing A Wrinkle in Time in theaters? She explained on her GoFundMe page. Since the start of her campaign on November 13th, for Taylor everything has been a crazy and memorable ride. Disney caught sight of her, and as a result, Taylor was able to attend the premiere. 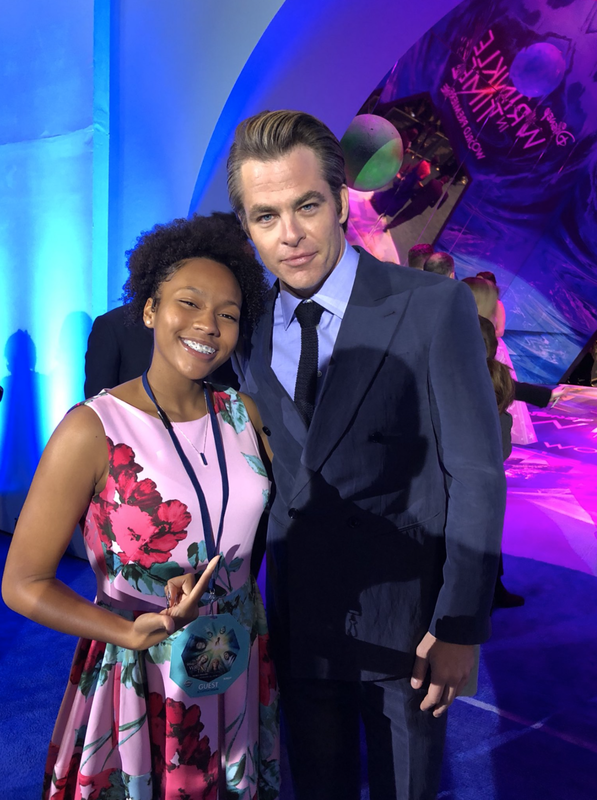 She was able to meet the director of the film, Ava DuVernay, actress Oprah Winfrey, and actor Chris Pine, among others. On top of that, aforementioned actor Chris Pine, who stars in the film as Dr. Alex Murray (the main character’s — Meg Murray’s — father), matched Taylor’s raised $25,000 — bringing Taylor’s efforts to her massive $50,000 to send girls to watch the movie, as well as help them purchase and read the original novel. We applaud Taylor for her constant efforts and constant successes in bringing more and more girls into the world of STEM through positive media. EDIT: In an incredible update -- Oprah Winfrey, who stars in the movie as Mrs. Which, matched the $50,000 Taylor Richardson made -- giving Taylor's GoFundMe a over $100,000! As of 9:00pm on March 7th, the GoFundMe total is $100,639! Back in the last month of 2017, it felt like the only thing we were hearing about was the cryptocurrency Bitcoin. Though it had started the year being worth $1,000, it had a huge spike in December that sparked the news media, having reached a worth of $17,000. Bitcoin may be the most popular cryptocurrency (at least in the United States), but it is far from the only cryptocurrency in circulation. It can be hard enough to keep track of Bitcoin, let alone the hundreds of other types of cryptocurrency around the world. However, as the world starts to become interested in the world of cryptocurrency, and as the world begins to lean on it, it’s important to keep track of its real world worth. 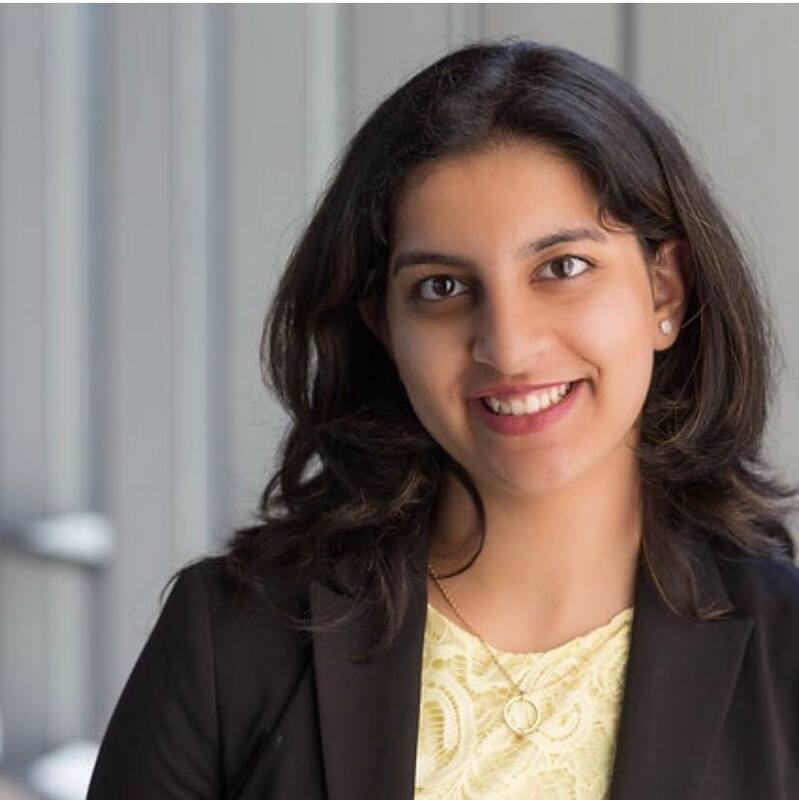 Harshita Arora, a 16-year-old coder, created an application just for that. Crypto Price Tracker, which made it to Apple’s App Store Top Charts, was published just last month on January 28th, 2018. Harshita, the mastermind behind the app, was kind enough to offer me a free version of the application in order to review it. * Honestly, the app was incredible. It was smooth; it functioned well; there were no crashes or bugs that I could see. It’s a simple app, but it’s simplicity doesn’t take away from it’s beauty — in fact, it may just add to it. After viewing the app and playing around with it, I decided to ask if Harshita would be willing to answer some of my questions about the application. She was completely willing to! Q: First of all, I want to thank you for being willing to sit down and answer these questions! I think that our readers will throughly enjoy this! Q: What inspired you to design this application in the first place? And what got you interested in Cryptocurrency? I remember the first time I came across the term cryptocurrency was in 2016. I read an article in a tech magazine (Digit) about Bitcoin and Bitcoin mining. Blockchain and building software on blockchain framework was a very interesting concept and business opportunity. Though, I never got around to building products in the field, as I was working on other projects. But in 2017, cryptos were just everywhere online. My Facebook and Quora feed were flooded with content related to cryptos and blockchain. So I started reading more online and got interested in cryptos. Q: What is the general goal of your application? A: Crypto Price Tracker helps users track prices of 1000+ cryptocurrencies from over 19 exchanges, set price alerts, manage crypto portfolio, and much more. The goal I had when I started out was to create one app where people can find and do everything they want to, to keep themselves up-to-date with cryptocurrencies and their prices, and manage their portfolio if they’ve invested in cryptos. Q: How long did it take for you to code, design, and develop this application before it was ready to submit? A: I started in November 2017 and I released the app on 28th January 2018. So it was a 2-3 months long journey from start to finish. It’s been an interesting ride! I’ve shared the journey until launch here in this post. I’m writing a post on launching, marketing, and getting feedback. Q: What was the beginning process of developing an application like this? Did you write the code from scratch, or use some sort of base? Was this for a classroom project, or just in your free time? A: The process started with having a product spec so that I know what features will go into the app. Then I began drawing user-flow diagrams and wireframes for each screen. I then designed all screens using Affinity Designer. That process took 3-4 weeks. I’ve shared my learnings and advice on how to design beautiful apps in this post. After designs were ready and imported in Xcode, that’s when I moved on to coding. Developing iOS apps is a lot of fun and the code was written from scratch. I used a lot of libraries, frameworks, and cocoapods. Mainly: SwiftyJSON, Alamofire, Charts, Popup Dialog, and CoreData. I couldn’t have developed the app without my mentors, Aviral and Bhavish. They were super critical in coding the app. And my friend, Harsh built the back-end on Firebase. It was not a classroom project since I do not go to school. I’ve been an unschooler for 1.5 years. Crypto Price Tracker is my first solo app. Q: How did you learn how to code, and what makes you so passionate about coding? A: I learned digital design and app design when I was 14 from my CS teacher. He’d assign really interesting projects to build, to give students real world design experience. He introduced me to Google’s Scratch and MIT App Inventor. I used to play around with them all day, for months, and that’s where I learnt basic programming concepts and built projects. Then I got the opportunity to intern at Salesforce in winter 2016 – which is where I got exposure to working in tech for the first time. I love designing and building products. And being able to build valuable software that solves a market need is a super fun and rewarding process. Q: Are you looking forward to creating new applications as well? And will they be long similar lines, or do you have new ideas that have nothing to do with Cryptocurrency? A: Yes! I’ve recently started working on an AI app with a friend. It’s an app in Health and Fitness – so a completely different market. I’d be sharing more on this app on my Medium in a few weeks! Q: Have you received a lot of positive feedback and support from anyone in particular? Strangers reviewing the application, or family members and friends? A: Yes! When I started out with this app, 5-6 of my friends in crypto helped me understand a lot of terms and concepts in crypto and helped me a lot in figuring out the features that people/users want. When I had a prototype in Adobe XD, I asked my friends to test it out and they gave a lot of positive feedback and suggestions for improvements. ~50 of my friends tested the beta when it was on TestFlight, which was 1 week prior to planned submission. I never got any strangers to test the app until v1.0 release. After the release, my inbox was flooded with emails from happy users sharing feedback and things to work on. Q: Would you call the application an overall success and a driving point in your coding career? Why? A: I think Crypto Price Tracker has been pretty successful in acquiring users and retaining them. I’ve gotten 1,500+ downloads in 2 weeks. 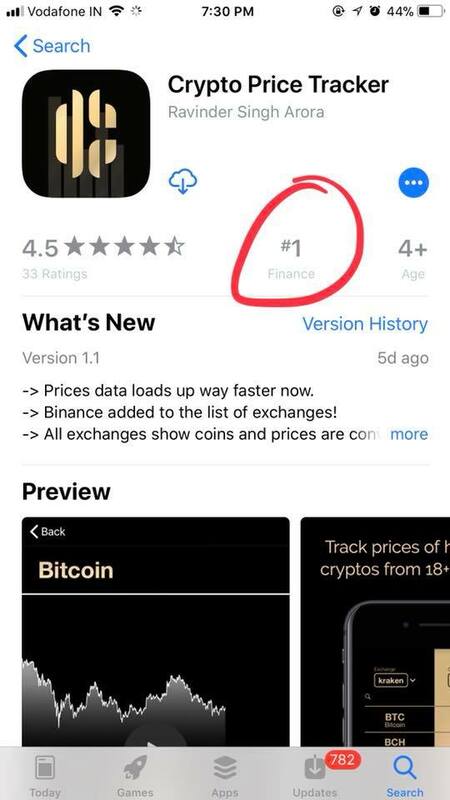 It was #2 app in Finance in the App Store top charts for paid apps within 24 hours of launch. It was featured on Product Hunt. A post about it on reddit got a lot of virality. And tons more good things have happened! I’m also getting acquisition offers right now. I’d say yes, it was definitely a driving point in my career in tech. Q: What would you say as a word of advice to anyone looking to get into coding themselves? A: Something I wish more people knew is that there’s a lot of resources online to ask questions if you get stuck. My favorite website is codementor.io. I’ve met a few of my coding mentors on the platform when I had questions. Another useful resource to ask questions (though you can’t get 1-on-1 mentoring) would be: Quora, reddit, StackOverflow. When learning to code, and especially if you’re self-learning with online courses and books, you will get stuck a lot. Knowing where to ask questions from more experience programmers and developers can help a lot! I cannot recommend downloading this application enough. Even if you don’t know anything about cryptocurrency, it’s amazing to see this young woman excel at what she loves to do — and to help support her. You can download the app on IOS devices here.